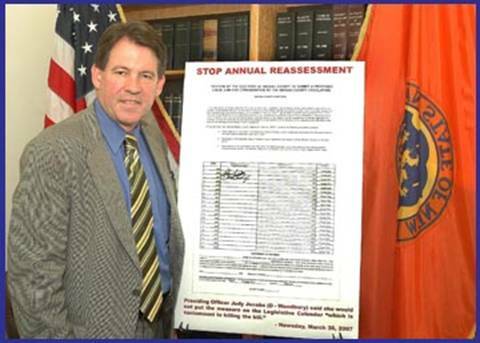 Nassau County Legislator Francis X. Becker, Jr. and the other members of the Republican caucus have started a petition drive to force the legislature’s Democratic Majority to hold hearings on a Republican proposal that would scrap the county’s current program of annual property reassessment. Earlier this year, the nine Republican members of the Nassau County Legislature sponsored a new law that would freeze property reassessment for five years. During this period, a homeowner’s assessed valuation could decrease but never increase. The Democrat Majority, which has complete control over what proposed laws are scheduled for a public hearing, has refused to consider the measure. “Enough is enough. People are moving out of Nassau County in droves due to rising taxes, and something must be done about it. I believe this measure will stop the constant increases, reduce the number of grievances and restore some predictability to household budgets,” said Legislator Becker. Anxious for action, Legislator Becker and his fellow Republican legislators have turned to provisions of the Nassau County charter and government law that would require the county legislature to schedule a public hearing on a proposed local law upon the submission of a petition signed by more than 2,000 qualified county voters. The legislators and candidates are circulating this petition throughout all nineteen legislative districts in the county to obtain the required signatures. “I have been taking this petition door-to-door throughout my district and the support has been overwhelming. I, too, want to stop reassessment and provide Nassau residents with the tax relief they so sorely need. This legislation deserves a proper hearing, not because I am asking for it, but because the residents of Nassau County demand it,” said Legislator Becker.